1. Anna Pushkarskaya article headlined "Law on rallies found uncoordinated" says the Russian Constitutional Court has recommended that the State Duma amend the law on rallies, namely, reduce the minimum fine for lawbreakers and make some other minor amendments. Meanwhile, several judges were eager to revoke the law completely; pp 1-2 (964 words). 2. Vitaly Gaydayev and Ivan Kuznetsov article headlined "Club IPO" says that several large investors will become owners of the shares of the Moscow International Currency Exchange, as it is carrying out its IPO; pp 1, 8 (571 words). 3. Yegor Popov and Dmitry Malkov article headlined "Harvesters no longer have their plant" says that the concern Traktornyye Zavody is closing its plant in Krasnoyarsk where harvesters and logging machines used to be manufactured; pp 1, 9 (663 words). 4. Oleg Trutnev article headlined "Beer in plastic bottles to be banned" says that new arguments against using plastic bottles for storing and selling beer have been voiced in Russia. The consumer watchdog Rospotrebnadzor will study the issue; pp 1, 7 (601 words). 5. Tatyana Yedovina and Alexei Shapovalov article headlined "G20 to begin reforms with Kremlin" says that Russian Finance Minister Anton Siluanov has unveiled the agenda of a meeting of the finance ministers of G20 member states to be held in Moscow; p 2 (450 words). 6. Anton Arsenyev article headlined "Presidential council starts tackling defamation" says the human rights council under the Russian president has drafted amendments to the law on defamation; p 2 (436 words). 7. Alexei Tkachenko and Nikolai Sergeyev article headlined "They learn assassination attempt on Russian president in Ukraine" says that Chechen national Adam Osmayev, kept in custody in Ukraine on charges of plotting an assassination attempt on Russian President Vladimir Putin, claimed that Ukrainian investigators had made him confess to the crime he had not committed; p 3 (778 words). 8. Kirill Belyaninov and Yelena Chernenko article headlined "Konstantin Dolgov makes Twit note" says Russian diplomat Konstantin Dolgov has written in his Twitter account that "two US lesbians" have illegally adopted a child from Russia, who is now suffering as the couple broke up; p 3 (950 words). 9. Nikolai Sergeyev and Georgiy Dvali article headlined "Givi Targamadze to receive international recognition" says Russia wants to put Georgian MP Givi Targamadze on the international wanted list as he is suspected of being involved in plotting riots in Russia; p 4 (430 words). 10. Yelena Chernenko and Ivan Safronov article headlined "Delayed disarmament action" says that Moscow has made it clear to Acting US Under Secretary of State for Arms Control and International Security Rose Gottemoeller, who has visited Russia, that no agreement can be reached on further nuclear arms reduction without US concessions on the European ABM; p 5 (751 words). 11. Maria Yefimova article headlined "Appointment fixed for Middle East four" says a meeting of the Middle East quartet (Russia, the USA, the UN and the EU) will take place in New York ahead of US President Barack Obama's visit to Israel; p 5 (672 words). 12. Article by Germany's Finance Minister Wolfgang Schaeuble headlined "European lessons for G20 countries" on the topics to be discussed at the G20 financial summit in Moscow; p 5 (1,066 words). 13. Olga Mordyushenko article headlined "Gazprom falls everywhere" says the results of Gazprom's performance in 2012 have shown that the gas monopoly has reduced gas exports to Europe and CIS states. Meanwhile, Russia's rival Norway increased gas export by 14 per cent; p 7 (663 words). 1. Valeria Khamtayeva and Alexandra Samarina article headlined "Valery Zorkin's shaky balance" says the Russian Constitutional Court has managed to please both the authorities and the State Duma opposition with its ruling on the controversial law on rallies; pp 1, 3 (875 words). 2. Anastasia Bashkatova article headlined "Pekhtin's lessons for officials" says that the Russian officials, unwilling to declare foreign property ownership, are unable to sell fast their property in the West, so they will have to register their housing in offshore companies; pp 1, 4 (884 words). 3. Ivan Rodin and Alexandra Samarina article headlined "Russia not to be left without orphans so far" says experts are skeptical about the Russian authorities' plans to help more orphans get new families; pp 1, 3 (749 words). 4. St Petersburg-based Svetlana Gavrilova article headlined "Union of city and village gets stuck" says that Federation Council speaker Valentina Matviyenko's statement on plans to make some regions larger has given rise to a discussion of the possible merger of St Petersburg and Leningrad Region; pp 1, 6 (626 words). 5. Tatyana Ivzhenko article headlined "Ukraine gets new gas trump card" says that following the Ukraine-Turkmenistan summit, Kiev demands that Moscow should allow it to import Turkmen gas in exchange for setting up the Russian-Ukrainian consortium to manage the gas transportation system in Ukraine; pp 1, 7 (809 words). 6. Darya Tsilyurik article headlined "Remote access medal" says the Pentagon has introduced a special medal for the servicemen controlling drones and for computer experts, as the US Armed Forces are using computer technologies on a larger scale; pp 1, 8 (637 words). 7. Ivan Rodin report "Save on democracy" says that the government has tabled with the State Duma a bill on recognizing the Internet as an obligatory part of election campaigns; p 3 (550 words). 8. Alexander Filippov report "Political and police" looks at two types of state systems and says that there is no national identity in Russia; p 5 (4,000 words). 9. Vladimir Skosyrev article headlined "Iran increases power of nuclear industry" says that Iran is trying to buy 100,000 magnets abroad to improve its uranium enrichment facilities. The plans violate the UN sanctions against the country; p 8 (860 words). 10. Yevgeny Grigoryev article headlined "Obama's plan and Putin's plan" says the EU is considering a proposal by US President Barack Obama to set up the North Atlantic free trade zone; p 8 (717 words). 11. Yury Paniyev article headlined "Washington needs Moscow's support" says the USA has drafted a plan for Syrian President Bashar al-Asad's resignation. New US Secretary of State John Kerry has called on Moscow to stop supporting the Syrian regime; p 8 (688 words). 1. Anastasia Kornya and Maksim Glikin article headlined "Ruble scarecrow" says the Russian Constitutional Court has made the controversial law on rallies more lenient. Street protests have died out, so the Kremlin chooses less tough policy; pp 1, 3 (659 words). 2. Mikhail Overchenko and Nadezhda Dmitriyenko article headlined "Soros goes back to the good old days" says Soros Fund Management has made extra 1bn dollars on fluctuations of the yen exchange rate; pp 1, 15 (620 words). 3. Editorial headlined "Security metaphors" comments on Putin's speech at the meeting of the FSB (Federal Security Service) board where he instructed secret services to take the work of NGOs under control and stop extremism from spreading in the Internet; pp 1, 6 (455 words). 4. 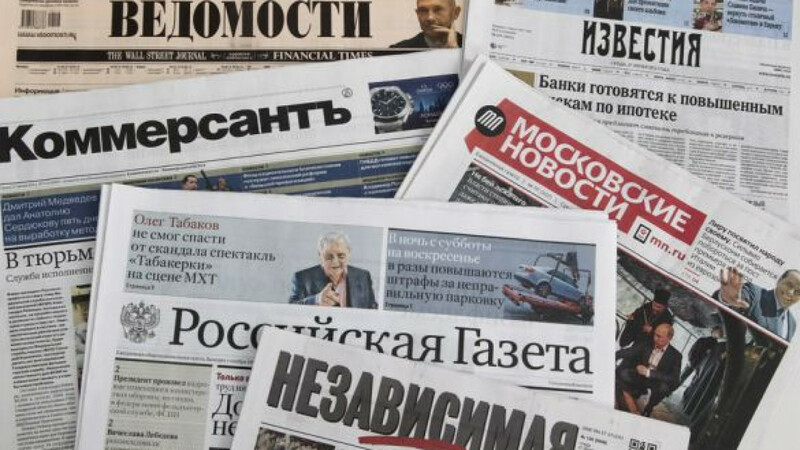 Liliya Biryukova report "Right to write about people" says that the Russian mass media is trying to defend its right to publish publicly available information about people; p 2 (800 words). 1. Anna Lyalyakina article headlined "Regional Development Ministry to double number of Russians for R125bn [4.1bn dollars]" says the Regional Development Ministry has drafted a programme to popularize the Russian nationality among Russian Federation residents, as only 44 per cent of Russian citizens identify themselves with the country, but not with their nationality; pp 1, 4 (562 words). 2. German Petelin and Yelizaveta Mayetnaya article headlined "Environmentalists ask to give Serdyukov's dacha to nature reserve" says that Krasnodar environmentalists want to ask the authorities to hand over the dacha illegally built by former Defense Minister Anatoly Serdyukov's brother-in-law on the Black Sea shore to a nature reserve; pp 1, 3 (635 words). 3. Mariya Kiseleva interview with Aeroflot head Vitaliy Savelyev speaking on plans to introduce blacklists of unruly air passengers in Russia; pp 1, 4 (1,965 words). 4. Alexander Yunashev article headlined "President told about US pressure on Russia" says that FSB representatives have expressed concern about growing pressure of the USA on Russia. The issue was discussed at the meeting of the FSB board chaired by Putin; p 2 (796 words). 5. Alena Sivkova report "Putin's coach fights for including sambo in Olympic program" says that Putin's coach and president of the international federation of sambo Vasiliy Shestakov plans to submit to the International Olympic Committee a request to include sambo in the Olympic program; p 2 (650 words). 6. Alexander Grigoriyev article headlined "Targamadze charged in absentia with organizing unrest" says that criminal proceedings will soon be instituted against former Georgian parliament member Givi Targamadze over attempts to organize mass unrest in Russia; pp 1, 4 (1,400 words). 1. Natalya Kozlova article headlined "Suspects to be made to sit on sofas in soft way" says that new regulations regarding house arrest have been introduced in Russia. The paper publishes the relevant law; pp 1, 17 (620 words). 2. Vladislav Kulikov article headlined "Get together!" says amendments to the Civil Code allow small groups of Russians to register unions to defend their rights; pp 1, 17 (586 words). 3. Yelena Kukol article headlined "Thousands of billions do not see light" says that 211bn dollars has been illegally withdrawn from Russia over 18 years. Meanwhile, 552.9bn dollars was illegally brought into the country and was used in the shadow economy; pp 1, 5 (672 words). 4. Kira Latukhina report "Extremism will not prevail" looks at Putin's meeting with Federal Security Service officers; p 2 (1,400 words). Oleg Kiryanov article headlined "Pyongyang achieves everything itself" says that North Korea has de-facto become a member of the nuclear powers' club despite its economic hardship; p 8 (674 words). 1. Anastasia Rodionova article headlined "Playing at Navalnyy" details ways to look for the foreign assets of Russian officials, the knowledge that opposition activist Alexei Navalny shares with others; pp 1-2 (557 words). 2. Alexander Minkin article headlined "Trust leaves and does not come back" questions quality of the work of Russian secret services and law-enforcement agencies as they cannot track housing owned by officials abroad and cannot cope with corruption; pp 1, 3 (674 words). 3. Yelena Svetlova article headlined "Crown falls from queen of evidence" speaks out against possibility of returning the capital punishment in Russia due to poor work of investigators in the country; pp 1, 3 (706 words). 4. Olga Bozhyeva report "Plan to re-arm army fails" says that Putin's decree on increasing share of modern weapons in the Russian Armed Forces will not be fulfilled; p 3 (400 words). 5. Stanislav Belkovsky report "Pope shows way to Patriarch" looks at the role of the Russian Orthodox Church and its relations with the authorities; p 3 (1,300 words). 1. Alexander Litoy article headlined "Sensational court" says that the ruling of the Russian Constitutional Court to amend the law on rallies came as surprise for the law initiators and its opponents. Pundits say the implementation of amendments may take up to one year, while A Just Russia deputy Ilya Ponomarev expects resistance from the One Russia party; pp 1-2 (550 words). 2. Alexander Litoy interview with Vladimir Ponevezhskiy, one of the authors of the law on rallies; p 2 (300 words). 3. Yulia Yakovleva article headlined "Sadovoye Koltso brotherhood" says that Russian senators are introducing amendments in the law on the Federal Chamber, which in future will be elected via electronic voting similar to the one used at election to the opposition Coordination Council; p 2 (600 words). 4. Igor Lykov article headlined "'Vorkutinskaya': reasons of tragedy" comments on the explosion at the Vorkutinskaya mine; p 5 (700 words). 1. Vera Moslakova article "Officials want to hide private life from society" says that deputies are due to file amendments to the Civil Code putting a ban on disclosure of private information without a citizen's consent; pp 1-2 (400 words). 2. Nadezhda Krasilova article headlined "President equates opposition to militants?" comments on President Putin's address at an expanded meeting of the board of Russia's Federal Security Service; p 2 (350 words). 1. Yulia Latyniana article headlined "Absurd investigation" reviews the recent trail of Col Kvachkov and notes that the Russian law-enforcement agencies discredited themselves so much that many people are now questioning the results of their work, even if their worked well; p 8 (749 words). 2. Irek Murtazin article headlined "Will I become State Duma deputy? Yes, we have everything under control" says the law-enforcement agencies having evidence of Communist MP Konstantin Shirshov trying to sell a seat in the parliament waited for bringing charges against him for such a long period as the deputy must have been only a mediator; pp 2-3 (458 words). 3. Nikita Girin interview with blogger doct-z, who has been helping opposition leader Aleksey Navalnyy to reveal Russian deputies' illegal business activities and property abroad; pp 4-5 (1,800 words). 1. Viktor Baranets article headlined "Prosecution passes 'Serdyukov's case' on to investigators" comments on the latest developments in the fraud cases within the Ministry of Defense; p 5 (400 words). 2. Nikita Mironov interview with Moscow mayor Sergey Sobyanin; p 7 (650 words). 3. Oleg Potapov article headlined "H-hour for Olympic facilities" says that many Olympic facilities have already been built, but the main construction process is far from ending yet; p 8 (600 words). 4. Oleg Potapov article headlined "Army gains power" comments on the modernization of the Russian army; p 9 (1,400 words). 5. Andrey Sitkov article headlined "'Rys' will not keep up with 'Tiger'" says that the Russian Defence Ministry is due to replace Italian Rys armoured vehicle with Tiger armored vehicles produced in Russia; p 10 (700 words).